Alongside of manufacturing quality end products, as part of social and environmental responsibility, our aim is to minimizing emission, waste through undertaking recycling process in the process of sustainable manufacturing. When our product reaches end of life, we spend most of effort to bring it back and recycle the materials. 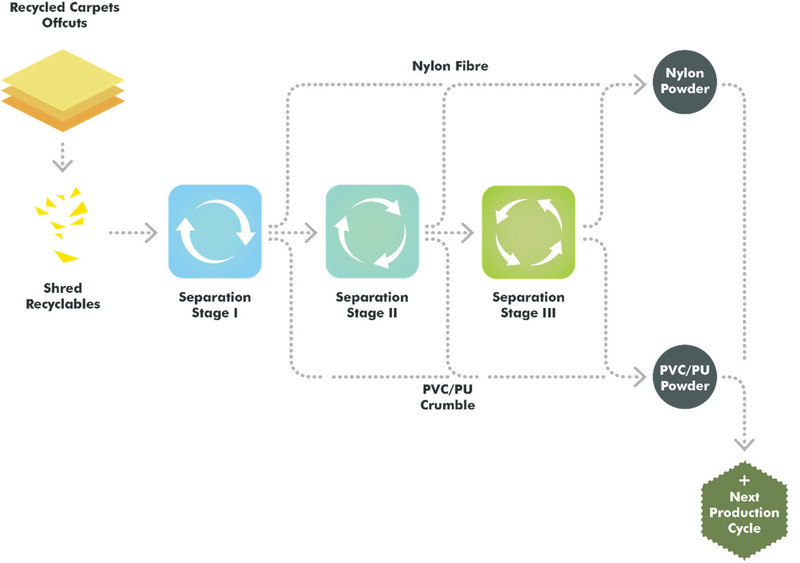 Our three‐stage separation recycling process is a key factor in contributing towards Eco‐Revive scheme. Recycled carpet tiles go through rigorous stages of separation and filtering, those material which meets standard will go into the next production line of carpet tile. During the production cycle, we eliminate all possible waste emission. For instance, with our Infinity Dye ™ Injection production technique, we completely eliminated discharging waste water and minimized raw material and energy consumption. This is achieved by direct ink injection into yarn face thus redundant or by‐products are brought down to a minimal level. A typical recycling process for off cuts & Pre-consumer recycled materials. These refined recycled materials are then added with virgin materials and go into the next production line.